5 Dual Resident Corporations Current Result: Under I.R.C. 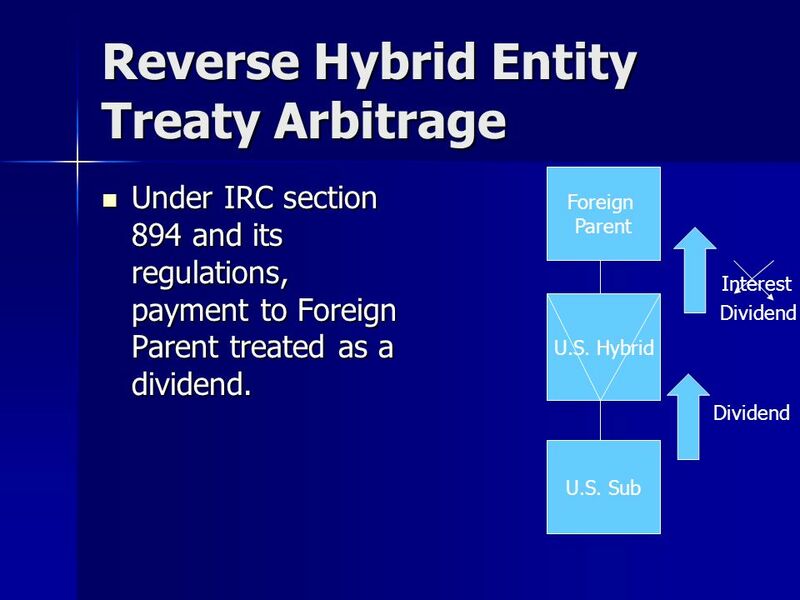 Section 1503, U.S. may deny use of $100 DRC loss against income of the U.S. group. 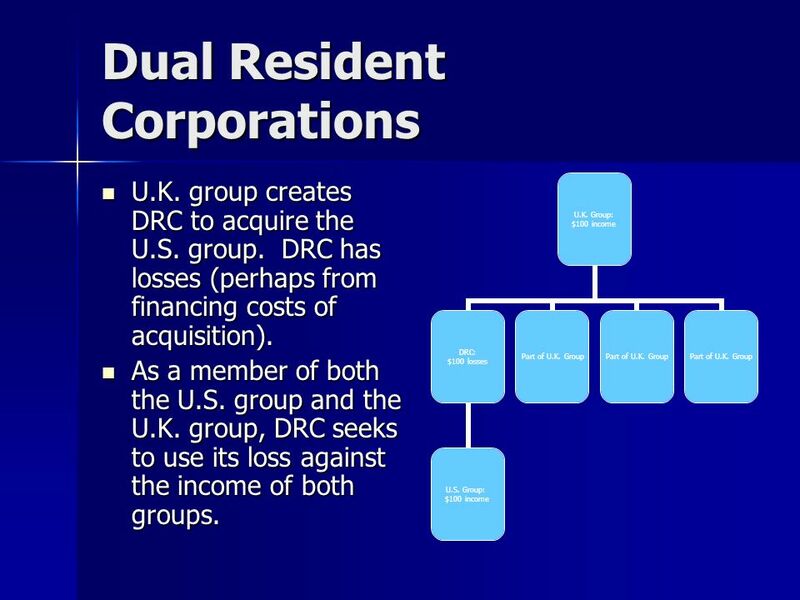 Under U.K. law, U.K. may deny use of $100 DRC loss against income of the U.K. group. Current Result: Under I.R.C. 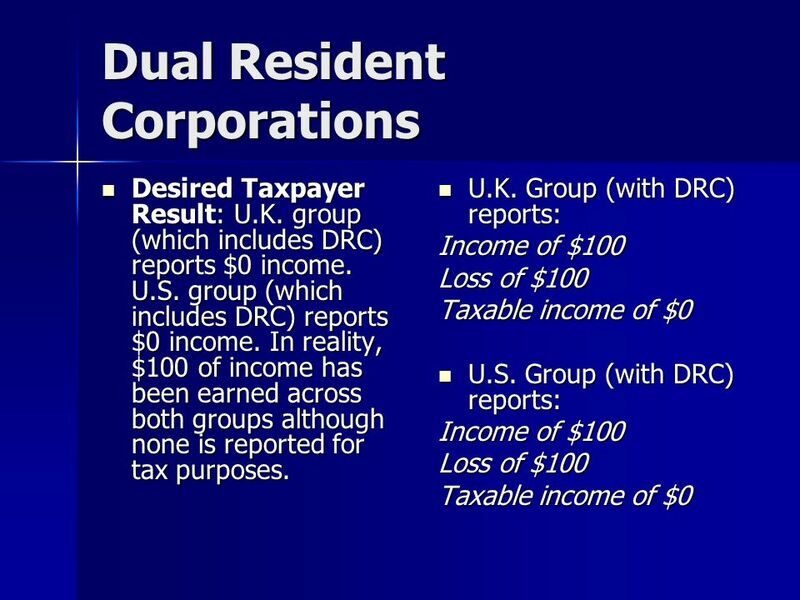 Section 1503, U.S. may deny use of $100 DRC loss against income of the U.S. group. 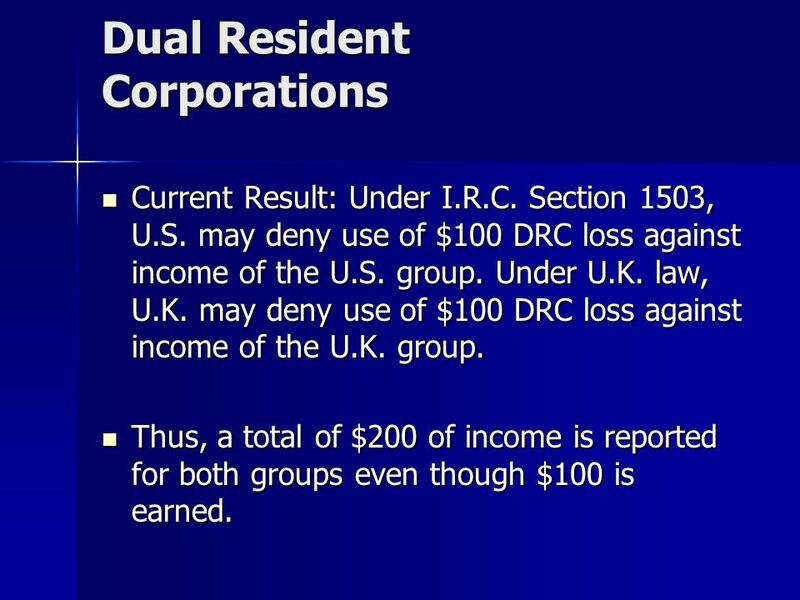 Under U.K. law, U.K. may deny use of $100 DRC loss against income of the U.K. group. Thus, a total of $200 of income is reported for both groups even though $100 is earned. Thus, a total of $200 of income is reported for both groups even though $100 is earned. 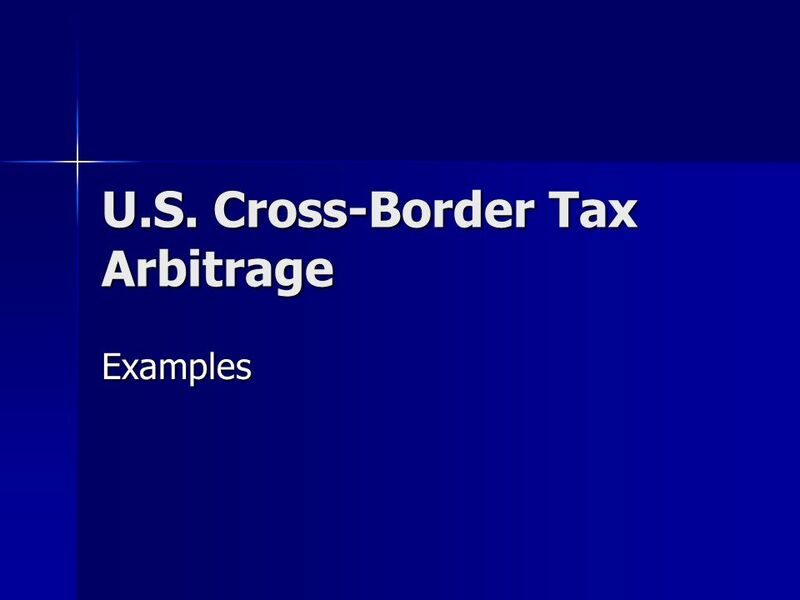 Download ppt "U.S. Cross-Border Tax Arbitrage Examples. 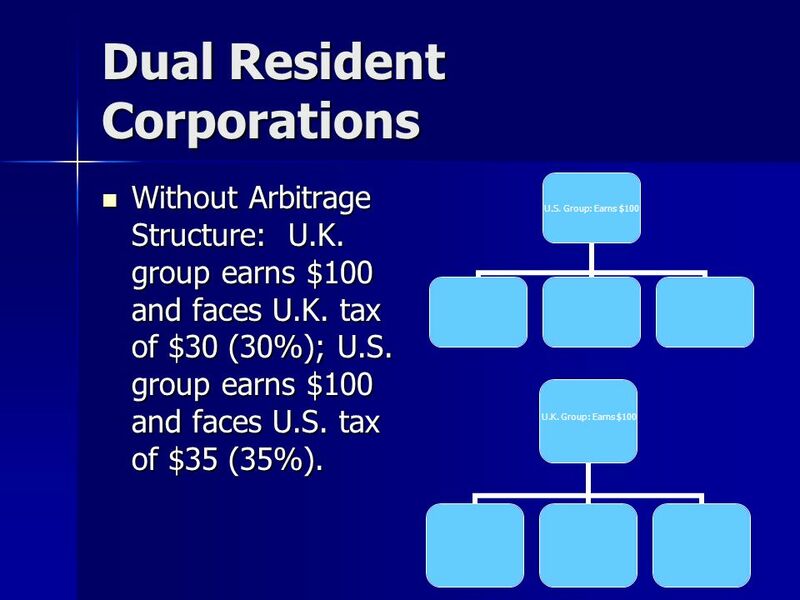 Dual Resident Corporations Without Arbitrage Structure: U.K. group earns $100 and faces U.K. tax of $30 (30%);"
1 CUNA Mutual Group Proprietary Reproduction, Adaptation or Distribution Prohibited © CUNA Mutual Group Trinidad & Tobago Holding Company Transaction Summary. 1 ESC-Dijon- Pole Finance – EU Tax – A. Ashta 1 EU Taxation 4. Parent-Subsidiary Directive Arvind Ashta ESC Dijon: Pole Finance. 1 International Taxation on the Road to Economic Recovery Clemens Fuest University of Oxford IFA Trilateral Meeting London, November 3 rd, 2010. 1 “Ireland as a Platform for European Expansion” Tax Considerations Adrian Crawford KPMG Tax Partner Dublin & New York “Ireland as a Platform for European. McGraw-Hill/Irwin Copyright © 2012 by The McGraw-Hill Companies, Inc. All rights reserved. Chapter 24 The U.S. 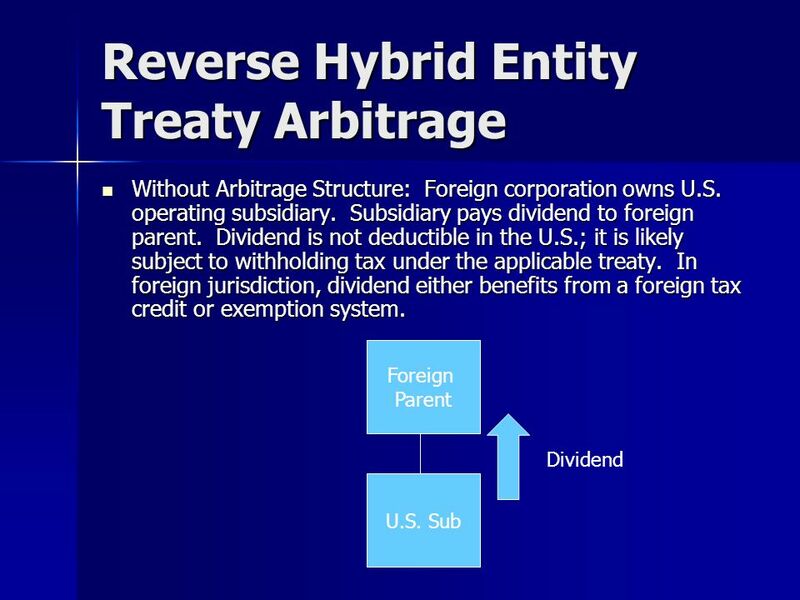 Taxation of Multinational Transactions. Irwin/McGraw-Hill ©The McGraw-Hill Companies, Inc., 2000 Principles of Taxation Chapter 12 Jurisdictional Issues in Business Taxation. C-342/10 Commission v. Finland Failure of a Member State to fulfil obligations – Free movement of capital – Article 63 TFEU – EEA Agreement – Article 40.
International Taxation: Debt Financing, Taxation and Transfer Pricing By Koy Saechao. Accounting 4570/5570 n Chapter 16 - International Taxation Issues. FROM PRINCIPLES TO PLANNING International Tax Treaties - Canada FROM PRINCIPLES TO PLANNING. 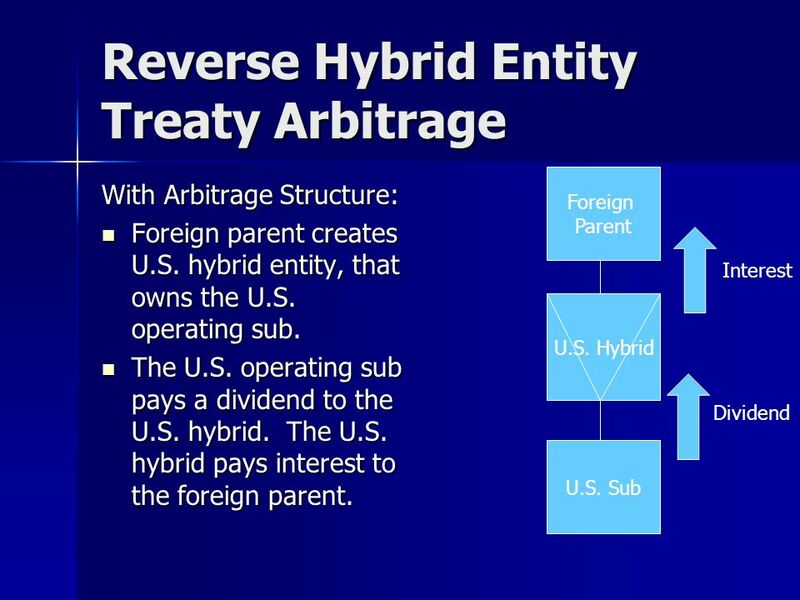 HYBRID MISMATCH ARRANGEMENTS OMLEEN AJIMAL Director of International Tax 21 November 2014. 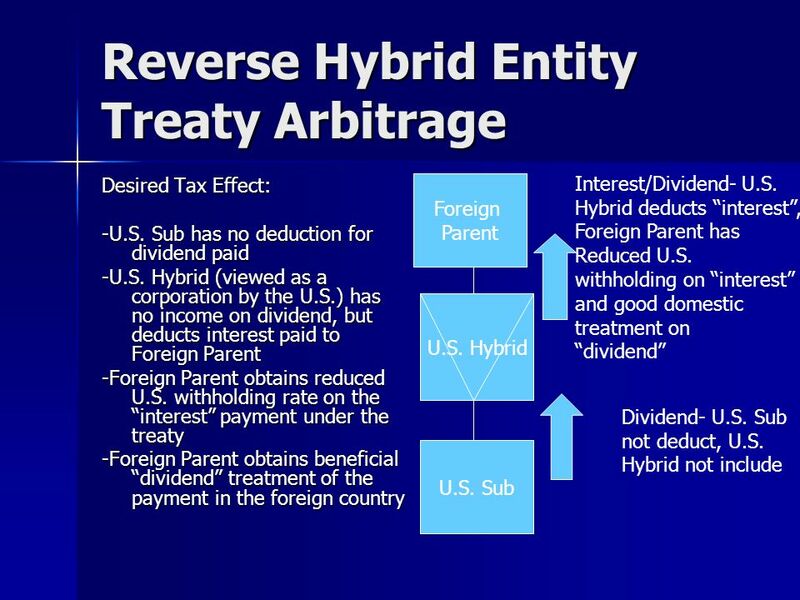 GLOBALSERVE INTERNATIONAL TAX PLANNING. MAXIMISATION OF NET RETURN THROUGH INTERNATIONAL TAX PLANNING GLOBALISATION OF THE WORLD ECONOMY HAS LED TO CROSS. 1.A tax exemption allows you to reduce your adjusted gross income and thus gives you savings on your tax owed. 1. Retirement savings can be counted as.